I'm tempted to let it hit 100%. It would be interesting if the percentage didn't just affect story, but the gameplay too. This is an amazing game keep up the good work! I love the game!!!! the combat system is so good, hacknslash,dodge,counter and stuffs! And if i defeat the first boss (sword of mother) what will happen? Otherwise, the first boss (Harbinger) in the tutorial level is totally beatable! The story will advance the same but you'll get some nice experience points to play with. This is a great feature, everyone be sure to read it, and thank you Early Access Gaming! Hi there, your feedback is heard! The game is being patched to reduce the amount of zoom and we'll work to give you some more options in a future release. Thanks for playing! When i first saw the game, i thought that it would be something like the binding of Isaac , the whole finish the stage move on to the next one , pick up items and so on, i was surprised to say the least. The game is amazing , although i was never good at these type of games , i had much fun and joy with this one! The controls are fluid and responsive , the art style is unique and beautiful and the combat varies with different skills and mantras. All in all , the game is amazing, the story though is a bit confusing , maybe i should finish the game first for that and stop focusing on the combat that much, i am also not great with gluing together pieces to understand it, so that's just me i guess... :p I hope the game continuous to grow and get more updates as time goes, i really believe in you and what you have done so far with the game, i hope the best for you and that one day the game will be a top seller! Semoga Ini web Bisa Berkembang Ya. I created an account just to compliment you for the game. Found the game by chance, was drawn in by the unique "hand-drawn" art style. I'm loving the keyboard control system (too lazy to pick up my pc controller from the drawer...) and the christian symbology being used. Combat system is also very pleasing to the eye (big fan of flashy slashes on-screen), but the dodging could use some refinement as it's somewhat stiff (can't really describe it any better). But don't let my criticism rub you the wrong way, overall the game is great! Thanks for the feedback mustangxy, I really appreciate it! If you're able, could you tell me a bit more about how or why the dodge felt "stiff"? It would help me better understand how I might improve it. Thank you! Ahem, here I am after a bit more of playtime. I focused my attention around the dodging during fights, and came to the conclusion that the dodging isn't stiff at all. It was actually a combination of: 1) me being unused to the slight inertia that is given to the moving character (which is totally okay, I just need to get accustomed to that); 2) the fact that I couldn't really figure out whether the dodging animation grants invicibility frames to the character, so sometimes I would dodge but still get hit, which kinda confused me as to whether I was actually dodging correctly. Anyway I had a lot of fun playtesting! Thanks again for reaching out, from a gamer's perspective it's always appreciated when the dev gets in touch. I'm sorry I can't contribute to the Kickstarter but I'm a bit tight on money (university student). Thanks for the clarification and for the second play! It's all still useful information. And no worries about pledging! If you like the game, spreading the word about it and the Kickstarter campaign is also immensely valuable! There's something really, really cool about this game. Could it be the unique art style? Maybe. Perhaps it's that haunting soundtrack? Possibly. Or is it the story trying to burst through all of that and tell us a dark, woeful tale tinged with hope? Could be. Personally I think it's all of that mixed together, and of course with the level up system and equippable and changeable powers. This is shaping up to be awesome, really hope you hit that Kickstarter target! I like the art style, the music it's great just like the atmosphere, a bit too much challenging but maybe it's because I need to grind more. Good luck with the Kickstarter campaign! This is great, thank you kanetsu! I hope you get to play more and improve. I'm also happy to see a video from Italy, where my family is from! How do you pronounce the title of this game, or do you say each letter individually? 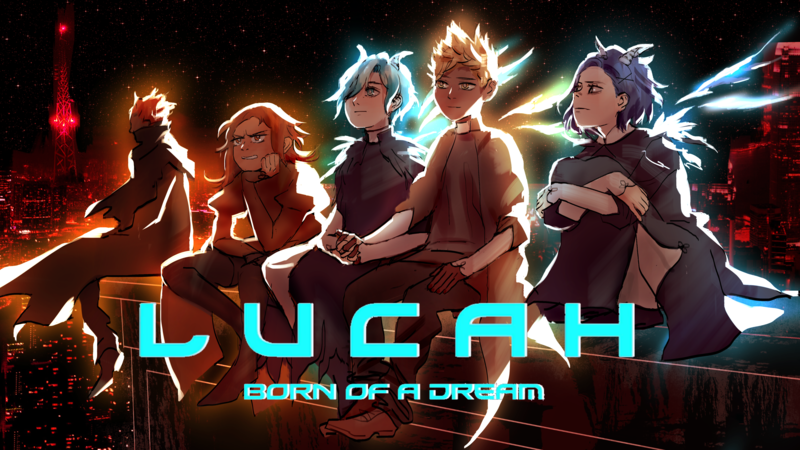 It's meant to be pronounced like the name "Lucah"
I've only seen the previews, and this game looks epic! I don't have a PC yet, so I'll wait until my birthday, but this will be the first thing I play! Looking forward to it! Hi Navejar, I'm so glad you decided to try it! Thanks so much for the feedback, I'll keep it in mind as we continue development! I created an account just to tell you that I really enjoyed this game, and that I wish you luck on your future endeavors and getting funded. This made my day; thank you so much Mekanik!! Thank you so much!! We can't wait to finish the game haha. Great game! Will you be putting it up on steam? Hi there! If the game gets funded and development can continue; expect it on Steam sometime next year! This game is absolutely wonderful. The art style is unique, the combat and customization gives plenty of options, but I have one question. Are you supposed to lose against Harbinger? Harbinger is technically beatable, so try that out if you can. Thank you! Hey,I'd like to ask if something more will happen when you defeat the first boss or the last boss. You can defeat the first boss and there's a big experience reward if you do! Messiah fight is technically impossible to win though (for now?). Ok,one more question.What will happen if the progress bar right upper is filled? Thanks for the video! Can't wait to watch the whole thing, and I hope you get a chance to play the whole demo! I'm gonna make a part series, this game looks and feels amazing! keep being awesome! This games combat was awesome and felt pretty rewarding for getting decent combos. I can't wait to play more of this game! It can be a great game in the future.Here I find a bug that you can cross the wall and wander in the black area in the zone 2. Hi there, good catch on the out of bounds error! Going to be uploading a patch to fix that. Which dialogue can't you pass in Chapter 2? Is it after the cutscene? It is the first scene after choosing difficulty.I tried pressing return button and left click,but it won't work. If you get to that part again, does anything happen when you press the 'E' key? Let me know! Just tried the demo out and the game feels fantastic! The controls are very responsive, the music is atmospheric, and I'm getting serious Bloodborne vibes. As a side note, it'd be really nice if d-pad controls were patched in for menu selections; I found myself habitually reaching for it much of the time. Some light SFX for menu selections would probably complement the overall level of polish well. Good luck with the Kickstarter; I hope LUCAH gets funded! Thank you Abhishek! I hope it gets funded too haha. One of the most unique aesthetics I have seen this year. It plays well and it allows people of many different gaming styles to give it a crack with their own playstyle.That is always a good sign for a role playing game as often times you can feel blocked in to a style less of your own design. In short give it a play. Thanks so much for the video =) the game has been updated since with a lot of tweaks and polish, be sure to check it out if you get the chance!! This game reminds me quite a bit of The Binding of Isaac in all the right ways! Brilliant game and I really look forward to playing more in the future! Here's a link for anyone interested in seeing it in action! Thanks again for playing Blootrix, I love the video! Have you been able to play any further? I've not had a chance to play it again yet, but I plan to continue it next week and I'm looking very forward to it!! The style is quite unique, i'm pretty sure it will be very popular rpg game in the future. The controls on a keyboard feels cluttered. I understand that it was designed to be played on Controller but I'm a keyboard cat. I found myself mistaking the E to be Shift and vice versa. The input also feels slightly delayed, which might be due to the slight hit delay or the time length of the attacks. I also found myself not using the target reticule at times due to the difficulty in using it in the middle of a fight. What I absolutely do love is the amount of polish the different aspects of the game recieve. The art style perfectly aligns with the dream-scape the game intends to deliver. The fights were well paced requiring knowledge of the enemies. Overall this is an excellent game for its position as in an Alpha state. If you continue to work on this following the tight control scheme and excellent combat that is reminiscent of Dark Souls I can see this becoming a fan favorite of those liking Dark Souls. This is going to be a hit. Loving the style. Hope you stick with it through release. Colin! Love the game - can't wait to see where it goes! Love the style and gameplay of this, tight!